Klotho is expressed in the rat parathyroid. (A) Immunoblot of microdissected parathyroid (PT), thyroid, and kidney using antibodies for Klotho and α-tubulin as loading control. (B) Real-time RT-PCR for membrane Klotho mRNA corrected for HPRT1 mRNA from microdissected parathyroid, thyroid, kidney, duodenum, liver, and spleen. Results are expressed as a percentage of expression in total kidney. Klotho mRNA expression is restricted to the parathyroid and kidney. (C) Immunohistochemistry with antibody for Klotho, FGFR1, and FGFR3 in thyroparathyroid tissue, showing specific expression of Klotho protein in the parathyroid and not in the surrounding thyroid (T) tissue. 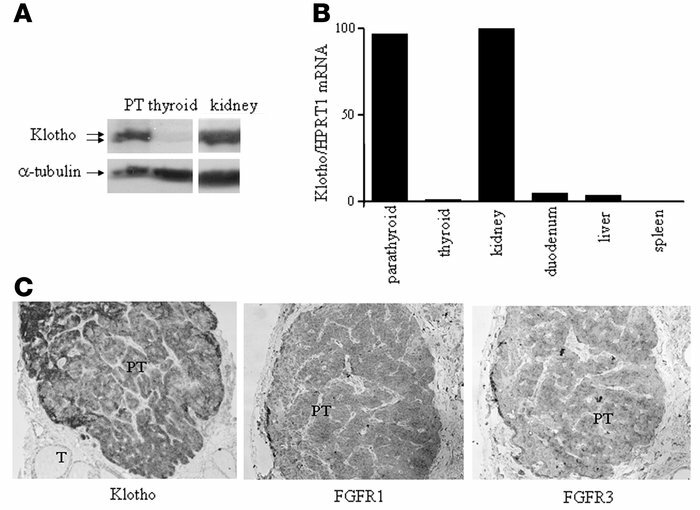 FGFR1 and -3 are also expressed in the parathyroid. A negative control without the primary antibody showed no staining (data not shown). Original magnification, ×100.